Me and my pumpkin. Photo by Megan Lavey-Heaton, The Patriot-News. Originally published in The Patriot-News on January 12, 2012. I never thought a pumpkin could inspire such joy in me. 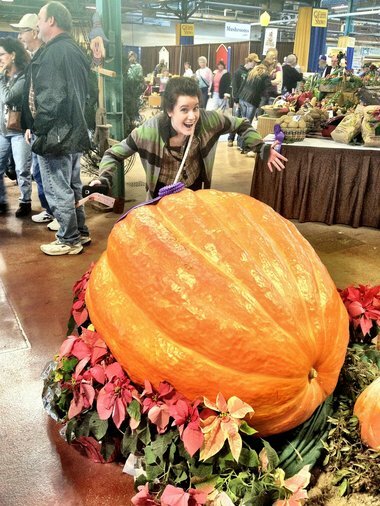 But, then again, I had never seen a 735-pound pumpkin before. Since I moved to central Pennsylvania in 2011, I had been hearing about the Farm show. If I had a nickel for every time I heard someone say “You have to go to the Farm Show,” I would be a… well, I would have a lot of nickels. Let’s just leave it at that. It should be noted that before I read the stories on the Farm Show last week I was convinced it was a place you just went to get milkshakes. That is definitely not the case, as I found out on Monday morning. Yes, the milkshakes were amazing— but the Farm Show is so much more than a single cup filled with dairy goodness. It’s an art exhibition, a vegetable freak show and a bustling boutique. The first thing I noticed inside was the smell. It’s a unique odor, a mixture of hay, dung and doughnuts, and it pervades the entire arena. One smell was stronger than the others, depending on where I was. I did my best to avoid the dung heavy bits. I scouted around the arena, ran into some friends and dragged them along on my journey. They were there to witness my squeals of joy, my pumpkin-themed rants and my duckling-inspired geek outs. The Farm Show, I found out, is full of the cutest things. Ducklings? Check. Bunnies with uber floppy ears? Check (double check because you could pet them, too). Baby chicks being born? Oh, yeah. Even the monster-size cows were precious. I’m sure my pitch went up several octaves out of sheer adorable exposure during the Farm Show. Someone should start an “Overheard at the Farm Show” Tumblr. I would totally follow it.